When I heard that Ralph Lauren was going to launch a new perfume in a jewel-studded bottle for some $2000+, I thought: why not — every other brand is jumping on the luxe bandwagon despite these tough economic times, why not Ralph Lauren? A week or so after I first heard about it, I spied a tester of something I didn't recognize hiding behind the tissue box on a Neiman Marcus perfume counter (always peek around the back, you never know what you'll find) and asked what it was. The sales associate told me it was to be the new Ralph Lauren, that it wouldn't launch until later in the year, and that it would be very expensive. She let me spray some on a card. I sniffed, giggled at the audacity of charging so very much for such a thing, and then promptly forgot all about it — easy enough, since Love, Ralph Lauren is not a particularly memorable fragrance. Later, I realized that it wasn't really so expensive, or at least, it needn't be. The bottle at top left is the luxury limited edition, and it's $2200. 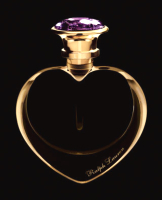 It has a 47-carat amethyst in the 24-karat gold painted cap, and it comes with a lucite stand. If you want to blow some money but not quite that much, you can spend $600 and get a 15 ml bottle of the Parfum with a crystal in the cap, and you still get the lucite stand. If you're a real tightwad, you can get the plain bottle with the plain cap (the one shown at top right, although it doesn't look so enthralling in real life without the nice blue background), for $90 (50 ml Eau de Parfum) or $135 (100 ml); sorry, no lucite stand. There's supposedly also a smaller size for $75, but I haven't seen it yet. He got his wish with the longevity factor; Love, Ralph Lauren lasts pretty much through the day. Whether any experts will find it special I cannot say, but this non-expert found it more serviceable than extravagant. The opening is sweet berry with added "fresh"; it does have some sparkle for a brief time (there's champagne accord in there, along with goji berry, cool green water accord, rose, magnolia, amber, iris, sandalwood, vanilla and patchouli) but there isn't anything special about it, nor does it smell like any extra investment was made in the materials. The dry down is that dark-but-scrubbed-clean ambery-patchouli-woods stuff that is already starting to bore me nearly as much as the ubiquitous fruity florals we've suffered through recently. The sweet fruit lingers through much of the proceedings, but more quietly as time passes; the florals are strong but vague. Love, Ralph Lauren is fine if perhaps rather dull. I said about the same about Notorious, but actually I like Notorious considerably better than Love. I suppose there are women on earth who will be getting the luxury version of Love for Christmas, and I hope they like it better than I did. Love, Ralph Lauren can be found at major department stores. Apologies to IrisNobile, but for this sniffer the words 'I liked Notorious considerably better' are the kiss of death. Good luck on the Stephen Jones, I want a bottle of that too! Will be curious to hear what you think of Love. I do think Notorious is, while not my cup of tea and not a good fit with the name, nice enough and it doesn't smell like everything else on earth. This one struck me as more “generic” for want of a better term — I almost can't remember what it smells like when I'm not wearing it. I am going to be surprised if this finds more fans than Notorious. But then, I've been surprised before! Oh good, it's such a useful word. Hope it gets added to the Scrabble dictionary too, it would come in handy there as well! Joe, when I think of the perfume you could get for $2200 — I mean, if I got this on Xmas morning, I'd cry at the lost opportunity. 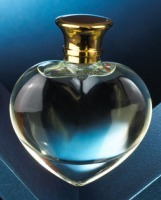 For $2200 you could fly to Paris and get a Lutens bell jar (and a bottle of Vetiver Elle at duty free on the way home). I may be alone way over here in the corner, but I like Love. It's good for the office, when I'm craving a patchouli/iris/sandalwood/amber thingy but can't go full-on, in-your-face with those notes because, well… I'm at the office. Yep, it's a toned-down version, and not an olfactive tour de force, but I like it. And the bottle is very pretty. Definitely worth a spritz if you happen to be strolling by the counter so you can test it out for yourself. Another thing I like about Love is that it shows that Ralph Lauren Fragrances, usually a very conservative company with a clearly defined image, keeps trying to stretch a little and go outside their comfort zone. Seriously, for that much I could have a lifetime supply of My Precious. Meh, Ralph, meh. Take that. Meh, now THAT's a word! I like it a LOT better than the fragrance. And backwards, it's hem, a nice throat-clearing judgmental word, that carries the gravitas that Meh avoids. LUCITE?? For that kind of cash, I want it displayed on the extended tongues of hovering hummingbirds and decanted onto the ear-tufts of snowy owls who will apply it to my pulse points. Lucite. Meh. They teach classes in that, don't you know — to make sure you don't confuse it with “cool blue water accord” or “cool clear water accord”? I could spend my entire Germany trip fund on the luxury version!!! I didn't try the fragrance yet, but the first bottle with the amethyst reminds me a lot of Princess (vera wang) bottle! LOL on both points, nicely put. LOL! To me, it just smelled a bit fresh in the top notes — I didn't find it very green or very aquatic. There you go. See, we're all saving money. Of course you can have it for $75, if it turns out you adore it — but yes, I'd call it safe but dull. Well, I have tried Love twice on card, and am afraid to say it didn't make enough of an impression for me to remember clearly what it smelled like on either occasion. I think the first time I did get a whiff of “nondescript, slightly luxury floral”, and the second time I got “nondescript floral” and couldn't detect the luxury. I need to try this properly on skin, but in Harrods one simply has so many distractions. I was just thinking the same thing! For $2K I could fly to Paris, and buy whatever I wanted from Guerlain, Montale, Amouage, etc….. I don't know if they're scrubbed clean, but when I think ambery-patchouli-woods stuff, I think of Prada, Stella Rose Absolute, Tom Ford White Patchouli, etc. If you are looking for a good way to research by notes, visit the Perfumed Court and click on “Perfumes by Notes” – its a good way to browse & learn. Maltesia, it isn't an accord really, maybe more accurate to call it a “style”. But I would think of DKNY Be Delicious Night, Tom Ford White Patchouli, Gucci by Gucci, Elle Yves Saint Laurent, Christian Dior Midnight Poison, etc. If you got the “luxury” even once, you got it more than I did. There are perfumes that smell expensive (Amouage Gold, Joy extrait) and perfumes that smell like they're supposed to smell expensive (David Yurman), this one didn't strike me as either. The first trial was under the watchful eye of the SA, who was really talking up the luxurious aspect, so my impressions may have been based on the power of suggestion – like the time my dad persuaded me to eat pistachio ice cream as a kid by swearing it was lime. definitely meh…smelled this a few months back by chance- immediatly non-plussed and can't remember much about it- soft floral. I was thinking it was water filled with those little green algae that float on the surface. LOL — and did you like the pistachio ice cream? You are not alone in your corner. I like most R.L. scents and I'm a pretty cool decent person. It will sell well, because it is targeted for the normal people who are not connoisseurs. I didn't even know about *niche* fragrances before I became interested in perfume making, about 4 years ago. Most people DON'T even know about niche. And Ralph Lauren makes scents for those in the majority. There are still quite a few people who don't have a computer or the Internet. There are a couple of gourmet food stores here, but most people just go to the grocery store. I'm sure Mariah Carey and some other “princessy” girls out there would love that amethyst canister but as a recessionista I'll stick to the plain jane bottles. Also; I can't really decide if it's a good thing that a fragrance is not really that much to remember; some fragrances have left me with offlicatory scars (?). Maybe bland isn't so bad? This one isn't bland, exactly — it's sort of strong, in fact. Just doesn't have a ton of personality, to me at least. Yeah, that would make me hate it too!